Dorothy A. 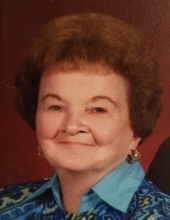 "Dot" Elison, 84, of Pottsville, passed away peacefully on Sunday evening in Providence Place, Pottsville. Born in Pottsville, on July 28, 1934, she was a daughter of the late Robert V. and Thelma M. (Crosland) Runkle. She was a member of St. John the Baptist, Pottsville, where she belonged to the church choir for several years. Dot was a very active member of the community, where she served on Pottsville PTA as Treasurer and President of Boy Scouts Line Troop 3. She held several offices on the Pottsville Wrestling Association and was a life member of the Yorkville PTA. She was a homemaker for her entire life and enjoyed spending time with her family. In addition to her parents, Dorothy was preceded in death by her husband, William C. Elison, on September 11, 2016, and to whom she was married 63 years; brothers: Francis and Thomas Runkle; sister, Jean M. Savary; and nephew, Mark Savary. Dot is survived by a daughter, Christina D. Seiger, wife of Mark, of Pottsville; three sons: Richard C., Elison, husband of Celie, of Brookshire; Ronald W. Elison, husband of Terry, of Breinigsville; Robert V., Elison, husband of Nancy , of Barnesville; grandchildren: Tara, Brian, John, Matt, Ryan, Emma, Michelle, and Holly; great grandchildren: Chase, Olivia, Lillian, Zepplin, Isabelle, Owen, Leah, and baby girl Elison due August 19th; brother-in-law, Paul Savary, of Allentown; and several nieces and nephews. A Mass of Christian Burial will be celebrated on Saturday, March 30th, at 11:00 a.m. at St. John the Baptist Church, 913 Mahantongo St., Pottsville, with Rev. David J. Loeper officiating. A viewing will be held on Friday evening from 6:00-8:00 p.m. at Lord-Bixler Funeral Home, Inc., 1818 Mahantongo St., Pottsville and on Saturday morning from 10:00 a.m. until the procession will leave for church. Interment will follow in St. John #2 Cemetery, Pottsville. The family request contributions in Dot's memory be sent to: St. John the Baptist Memorial Fund, 913 Mahantongo St., Pottsville, PA 17901. Lord-Bixler Funeral Home, Inc. is in charge of arrangements. Online condolences may be expressed at lordbixler.com. To send flowers or a remembrance gift to the family of Dorothy A. Elison, please visit our Tribute Store. "Email Address" would like to share the life celebration of Dorothy A. Elison. Click on the "link" to go to share a favorite memory or leave a condolence message for the family.